The 4038 is a classic Studio Ribbon Microphone designed by the BBC and originally manufactured by STC. 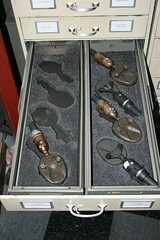 Coles, the outsourced manufacturer, bought the rights to the STC microphone line in 1974. Read about the research and design decisions that led to the 4038 in the BBC Engineering Division’s Monograph #4, The Design of a Ribbon Type Pressure Gradient Microphone (D.E.L. Shorter and H.D. Harwood, December, 1955) [pdf]. 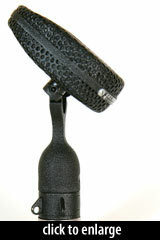 It is one of the world’s best-known ribbon microphones. The photo at right shows part of Steve Albini’s collection of 4038s. The mic’s frequency response is flat from 30 to 15,000 Hz. The ribbon maintains a uniform figure-of-eight polar response in both the horizontal and vertical planes. 4038s manufactured today are identical to those manufactured in 1974. Despite advances made, for example, in magnet technology, the 4038 utilizes the same magnet initially spec’d by the BBC in the 1950s. The output connector is a Western Electric 4069; the mic can be ordered with a 4069-to-XLR adapter. The ribbon material is among the thinnest of any commercial ribbon mic, at 0.6 microns. Its length is 1 inch, width 0.23 inches (5.8mm). It is tuned to approximately 45Hz. 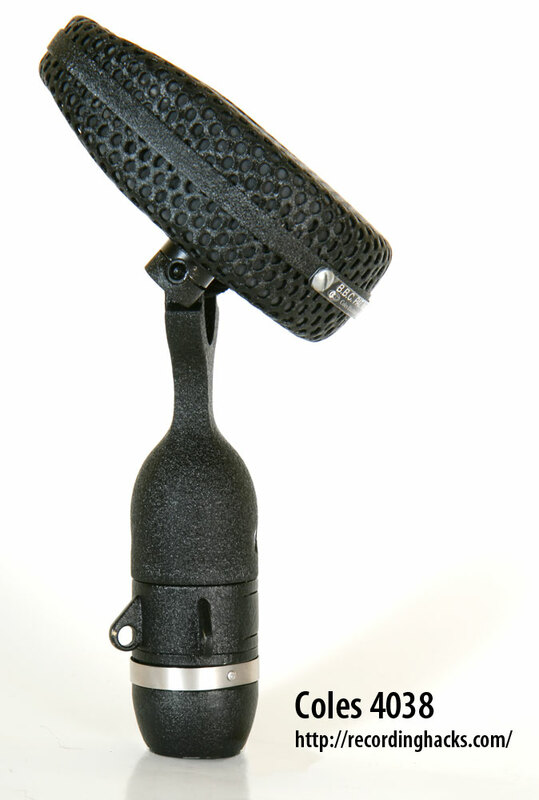 With its waffle-iron looking swivel head, the 4038 is one of the most unique mic designs ever and still the favorite ribbon mic of many engineers. It has one of the most unique sonic characters of [ribbon] mics. With a very pronounced midrange peak, it sounded amazing on drums, even in mono. For female voice, it had a nice presence without much high end. On sax, it had a presence that would cut right through a track, but it sounded a bit pinched to me. On guitar it was not my favorite. It was immediately obvious why these microphones are the de facto standard for drum overheads in many people’s books. Punchy yet warm, the kit sounded vibrant and balanced, if a touch dark. The Coles Electroacoustics 4038 is also known as: 4038 Studio. The mic was released in 1961.